They are indelible and impervious to water once dry, clean up with alcohol and re-wet themselves, allowing for unique effects and techniques not easily achieved with water-based systems. As a dye-based, highly transparent ink, Piñata Colors are unparalleled for vibrancy, and only the most lightfast dyes have been selected for the palette. 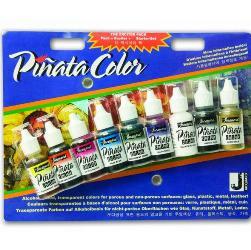 Acid-free with excellent adhesive properties, Piñata Colors have become the go-to inks for any non-porous surface. The updated colour selection includes: 002 Sunbright Yellow, 005 Calabaza Orange, 011 Senorita Magenta, 013 Passion Purple, 019 Baja Blue, 023 Rainforest Green, 030 Blanco Blanco, 031 Mantilla Black, 032 Rich Gold. The pack includes instructions in 4 languages.